I can't believe that Thanksgiving is just around the corner! Thanksgiving has always been one of my favorite holidays. As a girl we would go into New York City to see the Macy's Thanksgiving Day parade with my dad, and then help my mom with final meal prep! The day after Thanksgiving we would wake up SUPER early - like 4am, and hit the black Friday sales! I've always been a bargain hunter and Black Friday is one of my favorite holidays too, ha! But now I prefer to shop online and there are so many amazing sales that are coming up! 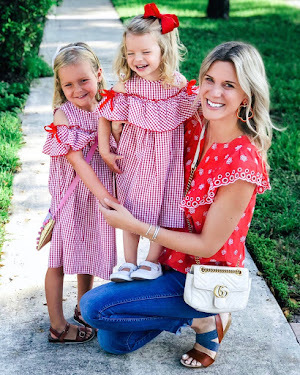 My first gift guide of this season is for the girls! 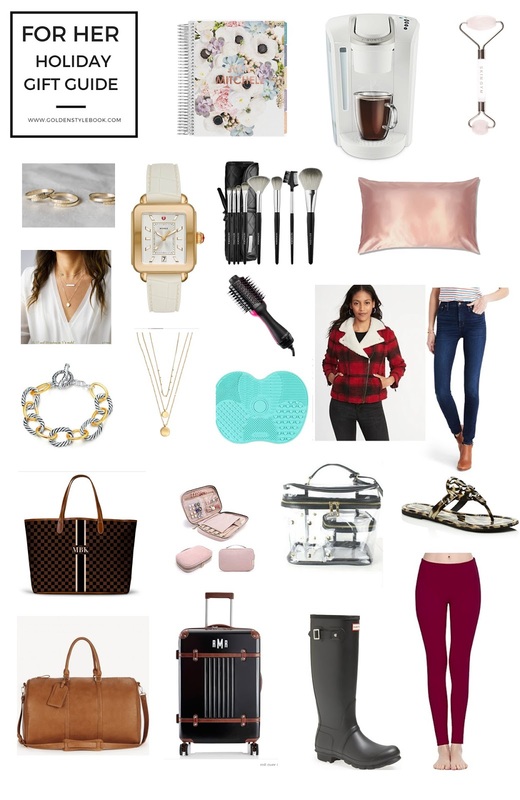 These are all items that I would love to get for Christmas. I don't know why but when friends and family ask what is on my list I freeze - I know some of my other friends feel the same way! I think because we are so busy caring for others that we forget about ourselves! This list will hopefully be helpful as you are shopping and giving your significant other ideas! Also great for gifting for your girlfriends, sisters, moms or MILs! Affiliate links are used in this post. Thank you for supporting Golden Style Book! Erin Condren Life Planner - A planner is almost always on my Christmas list! There is something so calming to me about starting the new year with a fresh planner and at least trying to feel organized, ha! I have tried a wide variety of planners but this one works best for me! Shop the Erin Condren Life Planner here. Keurig K-select Coffee Maker - We have had the same coffee maker for a LONG time and it's finally on its last leg. This one is the new version of the cofee maker that has lasted us through the years. I love that it is white so it will match our kitchen when it comes time to renovate! Shop the Keurig K-Select Cofee Maker here. Rose Quartz Crystal Facial Roller - I have heard so many great things about these rollers and this one has great reviews; reducing puffiness and wrinkles - sign me up! Shop the Rose Quartz Crystal Facial Roller here. Personalized Name Ring - These rings are so dainty and I love that they are personalized! Add your anniversary date, a special name or anything else! Shop the Personalized Name Ring here. Michele Watch - So this watch is a bit of a splurge, but one of these watches have been on my wish list forever! I love the cream and gold colors of this one. Shop the Michele Watch here. Value Set of Makeup Brushes - This set of makeup brushes is only $62 down from $160! I always think makeup brushes seem so overpriced, but this set is a steal, and is a great basics kit. I have a few brushes from the sephora brand and have been happy with them! Shop the Sephora Makeup Brush Set here. Silk Pillowcase - The SlipSilk pillowcase has been a splurge that I've been thinking about making for a while now! I have heard only great things and that it is anti-aging and anti-sleep crease! Anything to make my hair last longer between washes, ha! Shop the SlipSilk pillowcase here! Personalized Layered Necklace - This layered necklace caught my eye because of the unique stone in the first layer and the ability to personalize the whole thing! Shop the Personalized Layered Necklace here. Also shown above is a more affordable coin layered necklace (under $50) that I also love! Revlon One Step Hair Dryer and Curler - Anything to make mornings more efficient is a win in my book! Two of my girlfriends told me about this one and I am dying to try it! Shop the Revlon Dryer & Curler here. Sherpa Moto Jacket - Sherpa, Moto & Buffalo Plaid. Consider me sold! Plus it will be on major sale for Black Friday so that is a win all around! Shop the Sherpa Moto Jacket here. Madewell Non-Distressed Denim - Every year a pair of Madewells end up on my Christmas list! I think their jeans are one of the best jeans around especially for the price compared to other designer options! I have a ton of distressed denim and loved this non-distressed pair in a perfect dark wash! I wear my normal size 27 and find them to be TTS. Shop Madewell Jeans here. Styled Collection Link Lexi Bracelet - This mixed metal bracelet reminds me of David Yurman but it's only $38! Such a great girlfriend gift idea too! Shop the Lexi Bracelet Here. Silicone Makeup Brush Cleaning Mat - Cleaning makeup brushes can be a pain and this is supposed to help! Can't wait to try! Also a great girfriend gift option at under $6! Shop Silicone Makeup Brush Cleaning Mat. Barrington Gifts Custom St Anne Tote Bag - This carry all tote from Barrington Gifts has also been on my list for a while! I love that it can hold everything from my laptop to a bazillion snacks for the girls! The monogramming is such a great option as well! Shop the St. Anne Tote here. Travel Jewelry Case - On a recent trip a necklace that I love was SO tangled from being in a small zip pouch that was not designed for jewelry, that it was not salvageable! I was so sad, but it made me start hunting for a great travel jewelry case. I love this one because it holds several types of jewelry and has great reviews. It is also $26 and has prime shipping! Shop Travel Jewelry Case Here. Styled Collection Travel Vanity Bag Set - Along the travel line, this travel set is so handy and cute! Love that it is clear so you can see all that is inside as well! Shop the Styled collection Travel Vanity Bag. Tory Burch Miller Sandals - These are on super sale for $138 and I love the print!! I have them in a tan shade at the moment, but this animal print is like having another neutral in your closet! This off season pricing is the best! Shop Miller Sandals Here. Sole Society Weekender Bag - Currently on sale for $49! I love this tan color and a weekender bag is something I will get so much use from! Shop Weekender Bag Here. Mark & Graham Checked Luggage - I have the carry on version of this bag and love it! I get so many questions on whether it is worth the splurge and I have to say it is! It is SO easy to wheel through the airport and I love the monogram of course. ha! It makes it easy to spot at the carousel! Shop the Mark & Graham Luggage here. Black Hunter Boots - Living in South Florida, rain boots are essential! I love Hunters (size down one) and this black pair will go so well with everything! Shop Hunters here. Comfy Leggings - Leggings are such a wardrobe staple for me and this pair has the BEST reviews and I love this red color! Did I mention they are under $20?! Shop Leggings here. Happy Thanksgiving & Black Friday Sales!